It is with great pleasure that I introduce the Pro Carton Design Award winners for 2008. 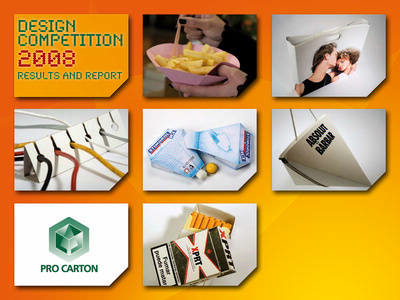 This competition is run every two years and the entries for the International event are drawn from the winners of the competitions that Pro Carton runs in several countries across Europe. These national events attract a great number of entries and also a great deal of attention and give students in particular, an opportunity to display their ideas and the innovative thoughts they have. We are always amazed by the variety of entries but more importantly by the invention that is shown and the way the entrants seem to look at ways of solving current problems. The day the judging is done is always exciting and this year was no different with over 50 entries laid out in front of the Judges for their scrutiny. I am of course once again indebted to Satkar Gidda for chairing the judging panel and for bringing his knowledge and experience to this event. We changed the panel of Judges this year slightly and I would also like to thank Guido Brosius of Carrefour, John de Somer of Van Genechten Packaging, Martin Luh of Nestlé and finally Ian Bates of Porta Brands for also bringing their expertise to this event. By having people in the judging panel from the Design Industry, the Brand sector, retailing and packaging manufacturing we hope to get an overall feel for what is truly inventive, exciting and new and by adding Ian Bates, who brings a wealth of experience in launching new packaging ideas, we hope that some of the winners will move into commercial production and success. The judging process took much longer this year than on the previous occasions and the Judges commented that the level of innovation was much greater both than in previous years and also than they were expecting. Decisions were difficult but eventually they reached conclusions and the results can been seen in this booklet that shows both the winners and those that were highly commended. In addition photographs of all the entries are in the booklet. This is the third time we have run this event and on each occasion the number of entries increases but more importantly so does the quality. It is very encouraging to see new ideas in such profusion and I feel that the future of innovative design in the packaging field is in good hands.